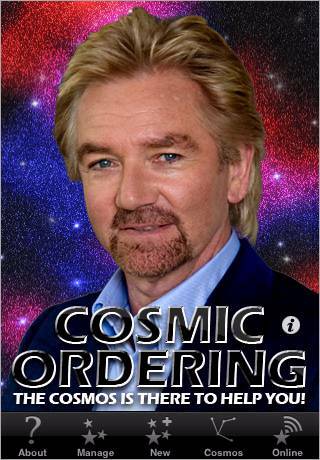 iPhone users searching for meaning and direction in their sad and unfulfilled lives can rest easy, thanks to Noel Edmonds and his Cosmic Ordering application. Can we forgive the Cosmos for Deal or No Deal? You could, of course, write down your aims and objectives on small pieces of paper - as recommended by generations of self-help books and those selling multi-level marketing schemes. But that wouldn't run an industry of books, courses and now an iPhone application, which keeps track of your aims with a "swooshy launch motif" particularly appreciated by one reviewer.